memory and at least 2.5 megs of higher (XMS/EMS) memory. not present in the file). * Version 1.0. 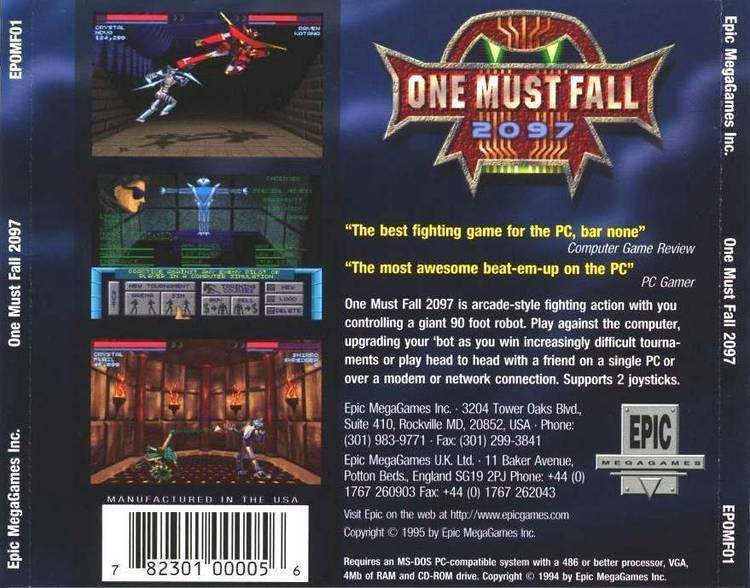 The initial release of OMF in 10/95. game to crash after you fought Raven in the tournament. * Version 2.0. Added the options of modem and network play to OMF. several bugs created by version 2.0.
don't recommend this because it might result in the game locking up. this game compatible with OS/2, but alas we were not successful. simple process, so please bear with us. Please skip this section if you have DOS 6.0 or later! B. Wait while your computer formats the disk. disk whenever you want to start OMF. A. Put the boot disk in your A: drive. hitting your reset button, or by turning it on. C. Wait while your computer boots from the boot disk. message "Starting MS-DOS..." to come up. Now press the [F5] key. and other programs which normally occupy main memory. Now change into the OMF directory and begin the game. message "You need (amount) of free memory to run this program". * At least 2.5 megs of higher (XMS/EMS) memory. computer! You'll need this much in order to have 2.5 megs free. Windows and try running it from DOS. be enough left for the game. "Booting your computer clean". See above for details! (otherwise your computer could not access the compressed space!). Editor by pressing ALT-F, then S.
to start OMF normally through DOS. Q: When I run One Must Fall, the computer locks up or reboots. not using a sound card, make sure that SETUP is set for "No Sound Card". details on figuring them out. sound card manual for details on fixing this. Q: OMF runs slowly on my 386 or 486 computer. What can I do? A: Your computer or VGA card isn't as fast as the game would like. "Video Options" menus and turning off "Animation", "Palette Animation"
and the other detail settings. Q: While playing, I get dumped back to DOS with an error message. managers and TSR's, or (2) you need more free memory to run OMF. Try booting clean and running OMF. its cause, but booting clean has always solved it. Q: My dad won't let me play past 11:00pm. What can I do? game so he'll be playing too! Q: I can't seem to get any sound from OMF. What did you do to me? the settings in OMF match that of your other programs. Q: The music sometimes skips like a broken record. handle the music and sound. they get cut off several seconds after a song begins. your sound card! Run SETUP again and pick the correct IRQ. One Must Fall should work fine with the PAS, PAS+, and PAS-16 sound cards. and setting up OMF for Sound Blaster emulation. sound card problems and obtaining the latest driver files. list of parameters possible for the advanced options line. this parameter, followed by the port address. -ACCEPT Accept calls in the background as game plays. -ANSWER Wait for a call then answer the phone. -BAUD Set baud. 2400, 9600, 14400, 28800, 19200, 38400. -COM <1/2/3/4> Use COM1, COM2, COM3, or COM4. Default is COM2. -DIAL "" Dial this phone number. this string. Just replace the "#" symbol with the IRQ used. does, use this setting (esp for Serial Link). -ONLINE My modem is already connected and online. -SERIAL Use direct serial link, not modem. -SET <8N1/7E2> Set data bits, parity, stop bits. Default is 8N1. -TERM Go into terminal mode so you can manually log in. play OMF at a reasonable speed. to turn you "Speed" setting up. Video Options - Turning off Video options will also make gameplay faster. Compression. Consult your manual for details. Q: OMF plays really slow over modem/BBS link. How can I speed it up? A: Some suggestions are listed above in the "Speeding up Net/Modem/BBS Play"
opponent's connection (baud rate and line noise on his/her end). Q: Help! I can't seem to connect with my friend by modem to play OMF. performing the desired function (turn off error correction, for example). connecting at various baud rates. IRQ. What can I do? A: Make sure you and your friend are running under the same operating system.